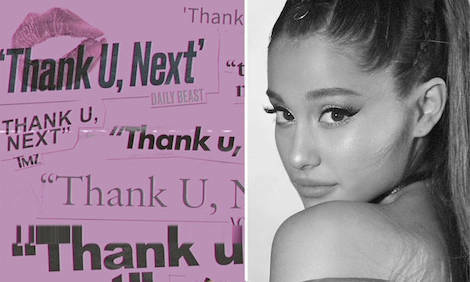 Ariana Grande has once again touched the hearts of many, with her new single, ‘thank u, next’, which was released on Sunday. Grande has had an extremely tough year, which many would find very hard to cope with. However, the ray of sunshine has not only brought herself some light out of the darkness with this song, but also for many other people too. thank u ♡ for hearing me and for making me feel so not alone ? i truly am grateful. no matter how painful! i’m thankful and i love u.
thank u, next is the power song I’ve been waiting for. thank u, @ArianaGrande ? A few weeks ago, it was reported that Ariana, and her ex-fiancé, Pete Davidson, had broken up. Despite the pair moving pretty fast with their relationship, with the two being engaged after only five months of dating, they seemed pretty happy. However, the media don’t always show the full story, so we never know what’s going on behind closed doors. Since then, Davidson has commented on the break-up in a jokey manner during a benefit comedy show he did with fellow comedian, Judd Apatow, and during this week’s SNL. "Some of you are curious about the break up but the truth is it's nobody's business and sometimes things don't work. She's a wonderful strong person and I genuinely wish her all the best in the world." After the rollercoaster year Grande has had, this song was just what she needed to hear. It’s titled, ‘thank u, next’, and it is about Ariana’s past relationships and what they have taught her. She didn’t trash talk anyone, and actually thanked all of her ex-boyfriends for making her realise that she needs to love herself before she can love anybody else. As she sings the verse, “plus I met someone else…her name is Ari.” fans absolutely lost it at how inspirational their idol is. She has become her own role model, and with so many people across the globe listening to this song and commenting on how they now realise their worth after hearing this song, their motive and outlook on life has changed completely. I, for one, absolutely adore this song, and it really is a testament to no matter how much things can break you, you can only fight and come out stronger. We love you, Ari! Do you think Ariana Grande has reached new levels of self-love with this song? Let us know in the comments, or on Twitter at @WhatsTrending.